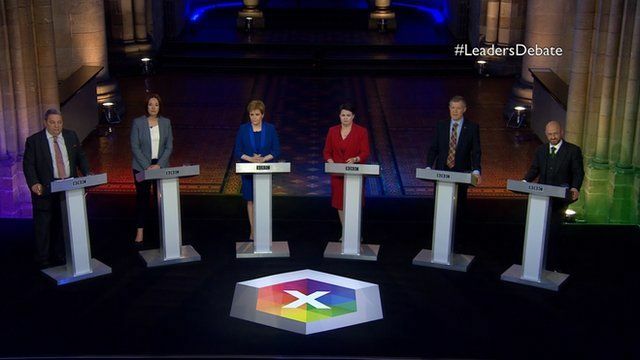 The leaders of Scotland's main political parties are taking questions from the audience in a live debate ahead of the general election. On the panel are: Ruth Davidson of the Scottish Conservatives, Kezia Dugdale of Scottish Labour, Willie Rennie of the Scottish Liberal Democrats, Nicola Sturgeon of the SNP, Patrick Harvie of the Scottish Green Party and David Coburn of UKIP. BBC Scotland's Sarah Smith and Jackie Bird are hosting the debate in Edinburgh. Watch live online and on BBC One Scotland on Sunday, 21 May, from 19:30 to 21:00. More explainers, backgrounders and analysis on the general election can be found on our special index.